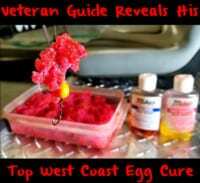 It seems that every year I find something new when it comes to curing my eggs for fall salmon. 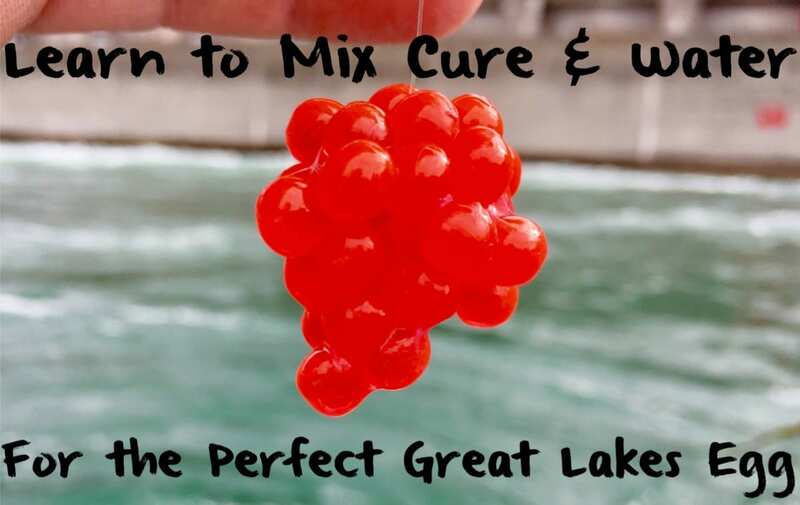 I’ve gone from shake and bake cures where you put the eggs in a bag and shake Fire Cure on them to other methods such as brines, but this year I’ve started to mix powder cures with water and it’s given me the perfect color egg we look for when fishing Great Lakes rivers. The brine I use now seems to do the best job at curing the eggs more evenly and giving us a lighter, more glowing color. On the river we don’t want that deep, dark, straight red egg. We prefer more of a lighter red egg that has pinkish hue or glow to it. While many anglers don’t believe a slight change in color makes a huge difference even the slightest alteration in hue can be the difference between a good and bad day. The below brine (that I’m using daily now) not only gives me that perfect color we’ve been looking for, it’s also easy to do. Once you come up with the color you like you can consistently get the same color every time. The best attribute of this brine is even if the eggs are immature the brine still cures them perfectly. This brings consistency every time. In the past I used to use straight 20 Mule Team Borax, but I experimented and substituted it with BorX O Fire this season it’s made a big difference. The egg color pops even more now. The BorX O Fire also creates firmer eggs as it dries them out better. Keep in mind we don’t like wet eggs around here. Meanwhile I still want the sulfites from the Fire Cure, which is why I mix the two. The standard base of the brine is two quarts of either spring or river water (we use these because there is no chlorine in it), a cup of non-iodize salt, a cup of pure cane sugar and a cup of BorX O Fire (mix half pink and half natural) and a cup of Fire Cure (half red and half pink). Take all ingredients and mix them into the water thoroughly. *You are welcome to use other color combinations in this step. Experimentation is key. Different colors work better in certain systems. *You can do two to three fish worth of butterflied skeins with the above measurements. At this point it’s time to place the butterfly skeins into the brine. Mix them around thoroughly and leave them in the solution for an hour. Remove the skeins and put them on paper towels. I let them dry for roughly 24 hours. How long I allow them to dry depends on how humid it is out. For example, if it’s more humid you’ll need to leave them out longer. I’ll check them at the 12-hour mark. When they start to feel tacky or rubbery to the touch they are done. 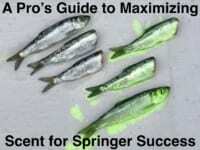 When you deem they are ready put them in Ziplocs and store them until you are ready to fish. Editor’s Note: Ted Kessler operates Rivermaster Charters. For more info on his guided Great Lakes salmon trips please visit http://rivermastercharters.com.